Although many people cringe at the thought of going to the dentist, it is vital to make regular annual appointments. Since patients gain many advantages from dental visits, the American Dental Association recommends that individuals should receive professional checkups twice a year. Here are some of the positives that come from routine office examinations. Uncover Small Problems Early. During routine dental visits, your dental provider will perform thorough exams of your mouth. Even though you may not be experiencing pain, it is possible that a problem exists. Your dentist may find a small cavity that can be simply fixed before a larger issue begins. Receiving a filling is much easier and less expensive than requiring a root canal in the future. Check for Other Oral Issues. During routine dental visits, your dentist will examine all parts of your mouth. 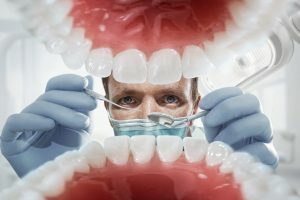 Although most people only think this professional looks at your teeth, he or she also is concerned with your gums, tongue, and other oral areas. Many times, your dental provider will screen you for oral cancer, which can save your life. Receive a Better Clean. Even when a person brushes and flosses daily, it is impossible to remove everything. With time, plaque accumulates and hardens into tartar. This is extremely difficult to remove at home. During an office visit, a dental hygienist will perform a thorough cleaning that removes this type of material from your teeth. A fluoride treatment may be applied as well. This will keep your teeth and mouth healthy. To learn more oral tips and to uncover what you will gain from routine dental visits, speak to your dentist. Dr. Dana Walters is always available to discuss ways to improve your oral health so that your smile looks great and your overall health is maximized. To schedule an appointment, call the office today.